One of Music by the Mountain's missions is exposing as many of our County’s youth to quality classical music performances. We aim to present two programs a year in outlying elementary and high schools. These programs feature vocalists, strings and mixed instrumental ensembles which include, most importantly, student participation! Financial contributions from donors enable us to bring professional musicians from the Ashland/Medford and Redding areas as well as the Bay Area. 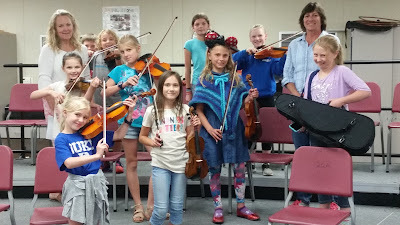 This Fall, middle school students who studied violin in 3rd grade with music teacher Carol Taforo, can continue lessons with professional violinst and educator, Carolyn Carl at Sisson Middle School by joining the Boys and Girls Club of the Siskiyous. In Fact, thanks to the Boys and Girls Club, any Siskiyou county school-age child may audition to join the violin classes being held in the Sisson Middle School space. Carolyn Carl will offer the more advanced class while Sisson Music teacher Liz Churchill continues to recruit beginning violin students in 4th-8th grade. We are excited to partner with the Boys and Girls Club of the Siskiyous in this project and plan to create other music courses for our youth through this collaboration. (For more information on the club, visit http://bgcredwoods.org/bgcsiskiyous). In January 2019, Mrs. Taforo will again open a beginners violin class for 3rd graders at the Mt Shasta Elementary School. Violins are furnished for 3rd graders by Music by the Mountain and various community members. Music by the Mountain is grateful for your donations that play a significant part in the promotion and financial support of these violin classes. Music by the Mountain has also developed a comprehensive list of local music instructors of all kinds. Our goal is to help students of all ages connect with qualified teachers in their area of interest. It is up to the student to make contact and agree on time and price of lessons with the desired teacher. The list is regularly updated. Siskiyou County is full of talent — please let us know if we have missed an instructor. If you know of other teachers who would like to be on the list, please contact MBM President, Mike Wright via email at: info@musicbythemountain.org or call 530-235-2355.